I’ve come to realize that cooking with certain styles of flavoring is a very regional and familial thing. People tend to cook the way their family cooks, which is usually pretty close to how other people in their area cook as well. Everyone’s food kinda tastes and looks alike. I was surprised to find out how many people have never eaten fried chicken seasoned with mustard… had never even HEARD of it. Well today is your lucky day, and that is all going to change. 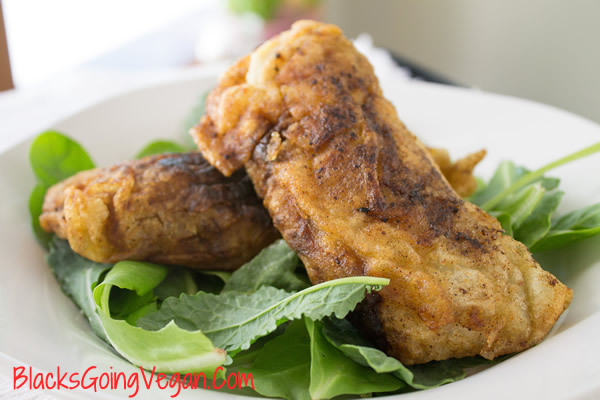 Because YOU my dear vegan friends, are about to rock some serious boats, break barriers, raise the roof, and turn it up with this version of Fried Chick’n Style Seitan that slays any and all other versions you’ve ever tried. You may disagree, but that’s my story, and I’m sticking to it. 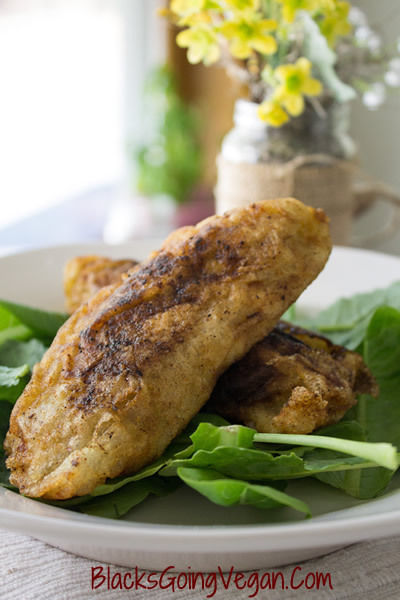 Now, the first thing you have to do is make sure you have some chick’n style seitan on hand. You can always buy it at the store, but why would you do that? You can make it easily from the recipe posted below, based on the basic seitan recipe on the back of the Bob’s Red Mill package of vital wheat gluten. 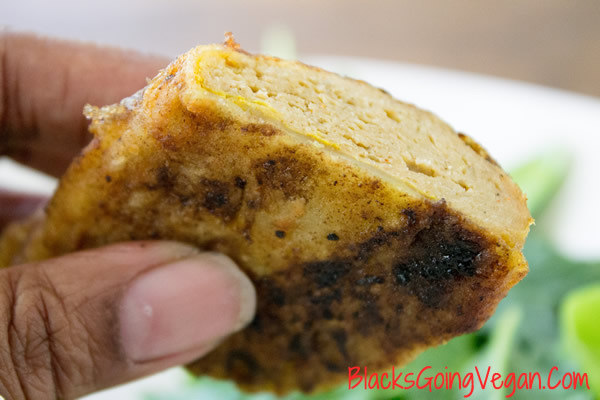 Of course I added a few tweaks to give it more flavor, but it’s an easy seitan recipe that even a beginner can have success with. Use this recipe, or whatever your favorite chick’n seitan recipe is. Oh, and feel free to do this part a day or two ahead of time. If you do, store your seitan in its cooking broth in the refrigerator or freezer. I actually recommend that you refrigerate it overnight (or at least six hours) for the best texture and firmness anyway. Once you have your seitan prepared, it will be time to get down with the frying part. 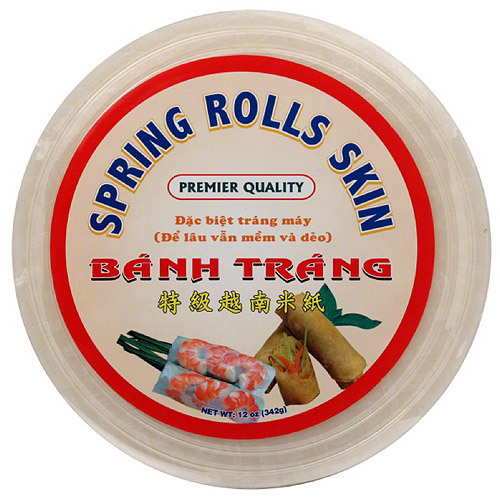 You’ll need to make a trip to an Asian market which is the only place I’ve been able to consistently find these super thin spring roll wrappers. We’re going to use them as the crispy “skin” of our fried chick’n. Secondly, you need to make your seasoning flour. Do that the same as you would when you fried chicken. I like to use a combination of onion powder, garlic powder, seasoning salt, paprika, Old Bay seasoning, and plenty of black pepper mixed into all purpose (unbleached) flour. I put mine in a Zip Lock type bag because it keeps flour from going all over the place making a big mess to clean up. 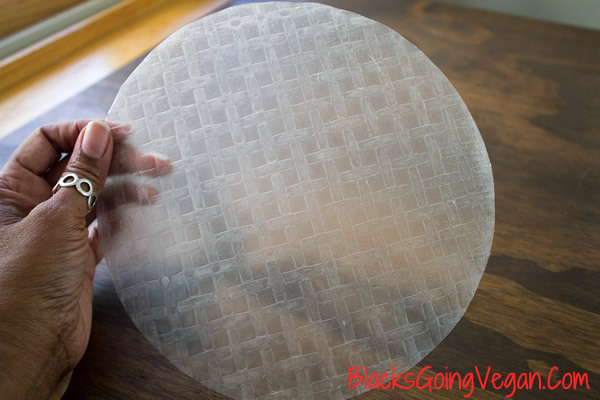 Put some warm water in a wide flat bowl or pie plate. Make sure you have counter space because you’ll need it for the assembly process. Then you want to make your mustard dip. Put some plain yellow or creole style mustard (about ¼ cup) into a small bowl. Add about 5 Tablespoons of water, a few shakes of hot sauce or cayenne pepper, and stir well. I call this a “dip” because you will “dip” the chick’n seitan pieces into the mustard mix before wrapping them, and coating them with seasoned flour. Step 1: Take seitan pieces and dip them all into the mustard sauce. Make sure each piece is coated well all over. Step 2: Get your flat bowl and place it in front of you. Put your wrappers off to the side. Make sure they do not get wet! Step 3: Take one wrapper and dip it into the warm water for about 3 seconds, turn and do other side. Let water drip away. Step 4: Lay wrapper on counter. Take one piece of mustard coated seitan and put it on the nearest edge of the wrapper. Fold it over towards the center of the wrapper snugly. Fold in the ends, then roll up the seitan like a burrito. The dampness of the wrapper should make it stick to itself and seal up tightly. Step 5: Fling it into the seasoned flour bag and coat it. Step 6: Remove from bag and sit it aside on a tray while you do the same to all the other pieces of seitan. Step 7: Heat your oil in a small frying pan, about an inch of oil is fine. When it’s hot, add just a few pieces of the wrapped seitan – do not crowd the pan. The rice paper wrappers will brown quickly, and to prevent burning you must cook only the number of pieces you can keep an eye on and quickly remove from the pan. Step 8: When browned to the level you prefer (takes between 60-90 seconds on my stove), then flip to other side to brown. Once its done, remove from pain, drain extra oil back into pan, and sit aside on paper toweling. These things are fabulous hot, but are just as good the next day sliced into a salad or served as a sandwich. I know from personal experience. One of the things people, especially Southerners and African Americans, complain about missing most when they transition to vegan is their fried chicken. Don't worry, I got you. You'll love this flavorful, tender, firm and juicy chicken-flavored seitan with it's crispy spicy coating. Mix together the vital wheat gluten and other dry ingredients spices in a large bowl. Combine minced garlic, oil and water in small bowl, then add all at once to the dry ingredients. Mix with a rubber spatula and your hands until all the dry mix is incorporated. Transfer dough to cutting board or counter top and knead like bread for about 3 minutes. Don't be afraid – really get in there pulling, rolling and knuckling. You'll see the texture of the dough change from spongy looking to smooth and firm. Return to bowl and let sit for 20-30 minutes to rest. After that, either press dough into a rectangle about ½” thick and cut into 1-2” wide by 3” long strips, or tear it apart into whatever shapes you want. Some people prefer uniform pieces of seitan, others want something more free-form. Place strips or pieces in the simmering broth mix. Turn heat on medium and once water is simmering, reduce heat to low so that broth is at barely a simmer. Let seitan cook in broth in covered pot for about an hour. You'll see that the seitan has doubled in size. Turn off heat and let seitan sit in pot until it cools, then refrigerate in broth overnight or for at least a few hours. Remove chilled seitan from broth, and drain on rack. Pat dry with paper towel. 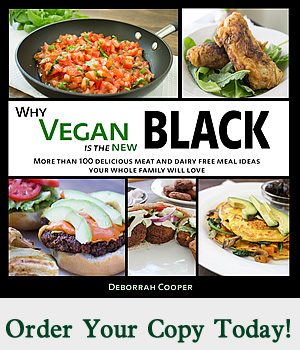 Find more fabulous recipes in the new cookbook WHY VEGAN IS THE NEW BLACK by Deborrah Cooper. Click graphic below for more information. This looks really interesting!I love the idea of using the rice wrapper. How do you find the texture of the “skin” in relation to your other fried “chicken” recipes such as the crispy spicy popeyes fried chicken recipe? I am anxious to try one of them and I am just curious as to which one we would prefer texture wise as i realize they have very different flavour profiles. Thanks so much, your food looks amazing! I think it just comes down to a matter of personal preference – probably based on time you have and what you already have on hand. I keep the rice paper wraps in stock because my daughter likes to make rolls out of them, but otherwise just doing the crisping method on the Popeye’s recipe works well.